The time has finally come for Nissan to unleash its sportiest Juke ever – the Juke NISMO RS. Prices start from £21,995 OTR and the arrival of the new car in UK showrooms marks the eighth new Nissan model to be introduced in 2014. With more performance, a sharper chassis set-up, more powerful brakes and extra equipment, the new RS is an even more extreme and focused version of Nissan’s multi-award-winning compact crossover. Options on the RS version include special Recaro sports "bucket" seats and the Safety Pack that includes the following: Xenon headlamps, Nissan's Around View Monitor and Safety Shield, Lane Departure Warning, Blind Spot Warning and Moving Object Detection giving visual and audible warnings to avoid potential collisions. The new Juke NISMO RS is available in a choice of three exterior colours – Storm White, Pearl Black and Blade Silver – with a single bespoke interior treatment. 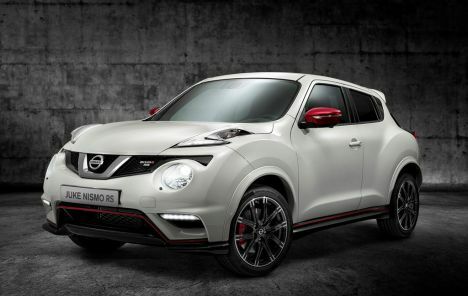 Despite its performance potential, the Juke NISMO remains highly practical. 2WD versions now benefit from a 40 per cent increase in carrying capacity, for example, thanks to subtle reshaping of the luggage area, while a two-stage floor and fold flat rear seats make the space even more flexible. Developed with NISMO's extensive global motorsport experience, the NISMO RS features a 1.6-litre DIG-T engine that develops 218PS (160kW), while torque in two-wheel drive/manual transmission versions is 280Nm. 2WD models benefit from the addition of a mechanical Limited Slip Differential (LSD) on the driven front wheels, while four-wheel drive models feature Nissan’s advanced Torque Vectoring System as standard, along with Nissan's Xtronic transmission, 250Nm of torque and standard-fit steering wheel-mounted paddle shifts. Other improvements linked to the increased engine performance include; strategic body strengthening to increase torsional stiffness further and a more powerful braking system that features larger discs than the standard NISMO model. Revised springs and dampers complete the package of dynamic enhancements. Watch Range Rover Sport being tested to the limit! New JCW Hatch is most powerful MINI ever! Wolverhampton Man wins two-millionth Qashqai! Nissan says "thanks a billion" to Leaf owners!